Brooklyn Heights is one of New York City’s most historic neighborhoods. In the 1830s, steam ferries made it America’s first suburb. In 1965, it became a National Historic Landmark and the City’s first Historic District. Today it remains a unique neighborhood worth preserving, a special place to live and a destination for visitors from near and far. rooklyn Heights is a family-friendly community in a neighborhood of overwhelmingly low-rise brick and brownstone row houses with a smattering of apartment buildings, as well as trees, playgrounds, and religious institutions of all types. We have one main shopping street — Montague Street — though interesting stores and restaurants also line Henry Street and others are tucked away on our quiet streets. Brooklyn Heights is also known for its cultural contributions. The Brooklyn Historical Society occupies a landmark Renaissance Revival building built in 1878-81 to a design by George B. Post. Over the years, the Heights has been home to many famous residents, including among others, the poets W.H. 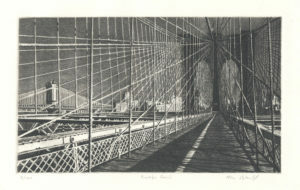 Auden, Hart Crane, and Walt Whitman, writers Harriet Beecher Stowe, Truman Capote, Carson McCullers, Norman Mailer, Henry Miller and Thomas Wolfe, playwright Arthur Miller, social reformers and activists W.E.B Du Bois and Henry Ward Beecher, and Emily, John, and Washington Roebling, who built the Brooklyn Bridge. POPULATION: Depending upon the source, Brooklyn Heights had either 19,923 or 22,887 people in 2010 based upon the census tracts included. Using the smaller figure, these residents were crammed into .320 square miles for a population density of 62,354 per square mile. The area’s population increased 1.5% between 2000 and 2010. Of that population, 77% is white, 7% African American, 5% Asian American, 7.5% Latino and the remainder, multi-racial. Females slightly outnumber males: 51.2% to 48.8%. The average household size is smaller in Brooklyn Heights than in the city: 1.9 vs. 2.6. And the percentage of family households is also lower: 31.1% vs. 43.7%. The life expectancy of Heights residents is 79.4 years. EDUCATION: Nearly two-thirds (63%) of its residents are college graduates compared to 38% for Brooklyn as a whole and 41% for New York City. MEDIAN INCOME: In 2013, Brooklyn Heights’ Median Household Income was $107,969 vs. $57,369 for the city as a whole. HOUSING: Of the 22,593 housing units in the Heights, 57% are renter-occupied, 40% owner-occupied and 3% vacant. TREES: In 2015, 1,300 trees were identified on Heights streets. CARS: Heights residents rely more on public transit than the average city residents. The average number of cars available for those in houses or condos is 0.5 vs. 1.8 for New York City, and 0.3 for renters vs. 0.6 for the city as a whole. The Brooklyn Heights that we know today was the idea of Hezekiah Pierrepont, who bought land “on the Heights,” laid out and named streets, and sold property to developers in the early 19th century. ierrepont's genius was in buying the rights to the ferry service and awarding them to Robert Fulton, who soon introduced faster steamboats across the East River, making the Heights easily accessible to Lower Manhattan. Speculation and small-scale development rapidly increased in the area as elite bankers and shipping merchants built massive mansions for themselves and bankrolled cultural institutions, like the 2,000-seat Brooklyn Academy of Music, which stood near Brooklyn’s new City Hall (now Borough Hall), the Post Office, and churches with soaring steeples. But the Brooklyn Bridge, completed in 1883, was a far more powerful symbol of the city’s growth and soon spread prosperity far into Brooklyn. Street car routes and then subways brought millions of residents to Brooklyn. This new development eventually led the newly wealthy to move elsewhere and precipitated Brooklyn Heights’ slow decline. The Heights’ huge mansions were torn down and replaced with apartment buildings. Adding insult to injury, the Brooklyn Academy of Music was rebuilt in Fort Greene after it burned in 1904. The Brooklyn Heights Association was born in 1910. Its founders were motivated by “the ugliness of the bridge approach and the depressing effect of elevated structures on the principal shopping thoroughfare, the consequent migration of Brooklyn’s wealthier residents to Manhattan and elsewhere and the corresponding depreciation of real estate values.” Following the 1929 stock market crash, private clubs closed and many homes were divided into rooming houses. However, some of the Heights’ wealthy families remained to enjoy the views from Columbia Heights. Appalled by Robert Moses’ plan to route the Brooklyn Queens Expressway through the heart of Brooklyn Heights, they testified in the mid-1940s before the Planning Committee to save the neighborhood. The now-beloved Brooklyn Heights Promenade was created on top of the BQE, which instead skirts the edge of the neighborhood. In the 1950s and 60s, young families were attracted to Brooklyn Heights by its charm, scale, and cheap housing stock. They grew increasingly concerned by private and public plans to demolish the Heights’ gracious homes and by Robert Moses’ slum clearance proposals. They painstakingly organized meetings, gathered data, developed a legal plan, and generated widespread support among their neighbors, and in the process, changed the BHA. This group of BHA leaders helped secure the passage of New York’s Landmarks Preservation Act and the designation in 1965 of Brooklyn Heights as New York City’s first historic district. Their advocacy also led to a smaller and more middle class Cadman Towers development instead of Moses’ massive scheme. Brooklyn Heights continues to look much the same today as it did in the late 1960s and has thrived with the influx of many new residents. Interested in learning more about the modern history of Brooklyn Heights? These resources provide a deep dive into the subject. This book by Martin L. Schneider, one of the essential Heights preservationists and a long-time Governor of the BHA, is an insider’s look at the dramatic history of activism that has preserved and shaped this unique neighborhood. One of the pivotal figures in the historic preservation movement, Pearsall tells the story of the nine-year effort to designate Brooklyn Heights as New York City’s first historic district and win the zoning change to limit building height to 50 feet. CURBEDNY.COM – “How Brooklyn Heights Became the City’s First Historic District”. This concise look at the history of Brooklyn Heights and the battle to preserve it is an excellent primer on the subject. In 1965, the LPC codified Brooklyn Heights' historic district designation in this document. When the BHA held its final House Tour in 2015, a 31-year tradition came to an end. Despite our best efforts, we had exhausted the supply of available new homes to put on the House Tour and could not go back to the same well over and over again. Being without a major fundraiser was painful because the legal expenses the BHA were incurring in defending Brooklyn Bridge Park as recreational space and upholding the commitments made by the Park Corporation to the community were a drain on our financial resources. But what to do to replace the House Tour? The BHA had some ideas, but either its timing was not right or the type of event was already being done by other organizations. We wanted something unique that reflected the BHA’s mission to protect, enhance and celebrate the neighborhood. Ellen Hamilton, a well-known Brooklyn interior designer, had an idea that had been percolating in her mind for a number of years. She suggested that the BHA do something that would continue to recognize Brooklyn Heights’ wonderful architecture while celebrating the borough’s emergence as a center of design. We live in a community where good design is appreciated, beautiful products are made, and many talented designers live and work. In her view, this added up to the BHA sponsoring a designer showhouse. It was an inspired idea. With Ellen’s experience as a successful interior designer, her extensive knowledge of the design community, and her willingness to serve as co-chair with BHA board member, Erika Belsey Worth, the idea transformed into a plan, and the plan resulted last fall in the first-ever Brooklyn Heights Designer Showhouse. Ellen recruited 15 highly recognized, talented designers - many of whom live mere blocks away - to transform the rooms of a classic 1860’s Neo-Grec house into a stunning design showcase. It was a critical and a financial success and created a template for future showhouses. Ellen, we could not have done it without you! For decades, the Brooklyn Heights Playground Committee operated as an independent entity. Two years ago, its leadership had moved on and the continuation of the family-oriented events it sponsored was in substantial doubt. These events were a neighborhood tradition. In addition to affording young children fun and entertainment, it provided parents with an opportunity to give their kids an outlet for their energy and to mix with other children, and for parents to mingle with each other, compare notes, and engage in some adult conversation. These events exemplify what it means to be a community by creating and strengthening the social bonds between its residents. To ensure that the community would continue to enjoy the tradition of the Egg Hunt and Halloween Parade, the BHA adopted the committee. But these events do not just happen, they require someone to take charge and to organize them. A permit to use the playground has to be obtained, the police department notified, supplies bought, activities and games created, volunteers recruited, events promoted, and monies raised to cover their expenses, but also to keep the playground locked after dusk. The person who stepped up to the plate and took charge was Jennifer LaRusso-Leung. She willingly and enthusiastically took on the responsibility to both organize these events and expand the mission of the Playground Committee. Last year, the Committee sponsored a new Schools Out! Event in June and is now contemplating an indoor winter event so that every season of the year will offer something for families to do. Jennifer has admirably exercised this leadership while she and her husband have young children to raise and a busy life to manage. In bestowing this recognition upon Jennifer as the Community Organizer of the Year, we honor her for her spirit of volunteerism, for maintaining and expanding upon a Brooklyn Heights tradition, and for making a sense of community tangible for the residents of Brooklyn Heights. When our parks look sparse, who you gonna call? When the entrance to the Promenade needs spucing up, who you gonna call? Serhiy Mshanetskiy. Who else? When Serihy emigrated from the Ukraine 20 years ago, he could not practice here as a medical doctor, which is what he was trained for, so he turned his healing talents to beautifying Brooklyn Heights’s gardens. The community has been the beneficiary ever since. We honor Serhiy tonight, not for his success as the entrepreneur behind his firm, Brooklyn Heights Gardens, but for his extraordinary volunteerism on behalf of the community’s public gardens. Serhiy’s roots are deeply planted in the Promenade Gardens and Cadman Park Conservancies. When the PGC was formed in 2009, Serhiy was at the first volunteer session. But whereas the other volunteers were green, Serhiy knew not only how to turn things green, but to make them bloom as well. Working alongside the Promenade’s Parks Department Gardener, he managed and trained the PGC’s volunteers who faithfully came every Tuesday to beautify the Promenade. Serhiy has taken sole responsibility for planting and maintaining the Flagpole garden at the Montague Street entrance, where he not only rolls up his sleeves to work, but contributes from his own pocket the labor of his firm’s employees. When the Cadman Park Conservancy was first formed, it had 40 students showing up and 500 daffodils to plant, but not a clue how to do it. Serhiy got a desperate call and saved the day. Since then, he has supervised and volunteered every year, contributing his time, tools and money to oversee the planting of over 10,000 daffodils and 2,000 tulips in both Cadman and Whitman Parks. No matter who you talk to about Serhiy, they describe his abundant knowledge, approachability and ability to mentor others. We bestow upon Serhiy tonight the honor of being Brooklyn Heights’ Master Gardener. Without constant attention, oversight and advocacy, neighborhoods cannot thrive as places people want to live. That TLC does not just happen organically. It demands the involvement of committed individuals we call community activists. At great sacrifice to their personal lives, they strive to make their neighborhood a better place. Irene Janner is just such an activist. Since moving to the Heights in 1978, Irene has been a stalwart advocate for, and defender of, Brooklyn Heights in many capacities. Her involvement in the PS8 PTA, including as its president, led to Irene becoming a BHA Governor and serving as its Treasurer for almost 20 years. In 2006, Irene stepped down from the BHA board to be the BHA’s Office Manager, a position she held until last year. And she continues to as the BHA’s bookkeeper. In the early 80s, Irene co-chaired the BHA’s Recreation Subcommittee, which was instrumental in paving the way for Brooklyn Bridge Park and was the forerunner of the Brooklyn Bridge Park Coalition established in the late 80s. Irene was the Coalition’s Treasurer and continued to serve on its successor, the Brooklyn Bridge Park Conservancy, until a few years ago. Never content to devote herself to leisure pursuits, Irene has been a member of the Community Board 2’s Land Use and Parks Committees since 1988 and was appointed as a board member in 1992. For the last decade, Irene has been the community board’s First Vice Chairperson, and if that was not sufficient, she has been the Treasurer of the Cadman Park Conservancy since its founding in 2011. When something needs to get done, don’t just ask a busy person, ask Irene Janner. She will get to work and ask for little in return. Tonight, the BHA is pleased to give something back to Irene by recognizing her with its 2017 Community Service Award. She richly deserves our tremendous gratitude for her many contributions to the community over the years. In the summer of 2012, the pop-up pool in Brooklyn Bridge Park opened with funding from State Senator Daniel Squadron and then-State Assemblyperson Joan Millman. With a commitment from the Park to keep the pool for five years, the pool was slated to permanently close at the end of last summer. The park administrators had not fully appreciated that the community had come to love its pool. The prospect of its loss was unbearable to the families from all over Brooklyn whose children used it and counted on it to stay cool. And we all know that when kids stay cool during the summer, their parents keep their cool too. Last June, the Brooklyn Bridge Park Corporation approved the development of two residential towers at Pier 6 where the community has long sought a grand entrance to the park. In the view of the BHA and other community groups, both the Park management’s decision and the manner in which the Park Corporation approved that decision violate the governing General Project Plan and the Park Corporation’s own procedures. The Park Corporation breached its commitment to the community to engage in real estate development at Pier 6 only when development was necessary for the Park’s financial needs. Within a month, the BHA filed a legal petition to prevent the Park Corporation from moving forward with the development. To develop the petition’s well-reasoned arguments required a vast amount of legal work as well as the involvement of individuals with knowledge of the history of the Park Corporation’s decisions. With significant input from several members of our community, our lawyers researched, analyzed, confirmed facts, developed arguments, and drafted the extensive filing that is the basis for the BHA’s lawsuit. The cost of this legal effort could have easily approached $1 million, but instead, the legal team’s services were provided pro bono. The Court has scheduled argument in this case for next Monday, March 6th. The BHA is fortunate to have had these resources made available to defend the principle that the park was created for recreational purposes, and not as a front yard for excessive commercial developments. When Seth Phillips arrived at PS8 in 2003, the school was in trouble, with steadily decreasing enrollment. Most parents from Brooklyn Heights and Dumbo sent their children elsewhere. In ways both substantive and symbolic, Seth embraced the challenge of reversing this trend. He literally kept his door open to parents, children and teachers, and in so doing, gained their confidence. With the help of the BHA, he reached out to zoned families, bringing them back in droves. Seth turned PS8 around by rebuilding it from the ground up. With the help of talented staff developers, he reinvigorated its academic core, and continues to update it. PS 8 was the first school in the district to integrate children with special needs into the school’s mainstream classrooms. On Day 1 he worked to strengthen the arts by establishing strategic partnerships with other organizations. He brought in a school librarian and worked tirelessly to get an addition to PS8. Immediately after completing the addition, with our elected officials and a dynamite PTA, Seth fought for and gained a middle school for the community. He now oversees BOTH PS8 AND MS8. One of Seth’s great strengths is his ability to recognize and promote teacher talent and to motivate those around him. He has been a mentor to teachers, and discovered and nurtured the intellectual gifts of all his students. He has also been gracious about sharing his experience with other school administrators throughout the district. By welcoming diversity and making PS8 into the school that so many parents want their children to attend, Seth has had to confront the vexing challenge of overcrowding. 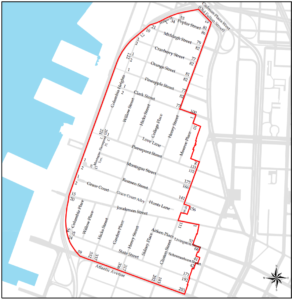 Last year, the DOE responded by shrinking the zoned boundaries for PS8. All of this has taken place in the unrelenting glare of the media. Yet throughout his tenure, Seth remained the beloved public face of PS in a way that brings enormous credit to him and to our school community. The BHA is pleased to recognize Seth with its highest honor, the Martha Atwater Award. On behalf of a grateful Brooklyn Heights, we wish him all the best in his new pursuits after he retires at the end of this school year. He and PS 8 have left the community a much better place and given thousands of students a foundation in life to build future successes upon. Do you care about Brooklyn Heights?